Catapult Cat Ltd is one of the world’s leading providers of food supplements specifically designed to prevent hangovers. The company was originally created by 4 Finnish private entrepreneurs in 2016, although product development on the innovative supplement began in 2010. The Catapult Cat supplement is gaining fast recognition around the world for its ability to target the cause of hangovers before they get a chance to occur. Catapult Cat, which is patented in over 150 countries, has exploded with popularity since hitting the market, allowing adult drinkers the ability to enjoy healthy alcoholic consumption. The company are extremely proud of their supplement and believe it has the ability to change drinking culture entirely. The supplement is also incredibly easy to use. All drinkers need to do is take one tablet before beginning to drink, then take follow up tablets every 1-2 hours for as long as they are drinking. Catapult Cat is already available in over 10 countries, with new business soon to come across Asia. Most excitingly, the company will soon be opening up their China office in 2019 in order to better accommodate the Chinese market. As for us here in the UK, you can get your hands on the supplement via CLF Distribution or even through Amazon. 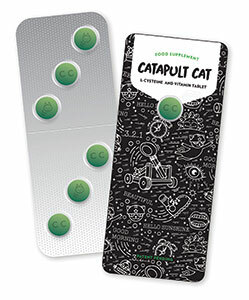 As one of the most innovative and beneficial supplements to hit the market, you can expect to find Catapult Cat Ltd at a number of trade shows. This includes Natural Products Scandinavia in Sweden, and Natural and Organic Products Europe in London. Not only that, but they will also be attending Natural Products Scandinavia again in November 2018, with more shows planned across Asia during 2019 to coincide with their Chinese offices. This entry was posted in Company of the Month, Featured and tagged Food Supplement. Bookmark the permalink.